A pro-Syrian Lebanese news anchor for NBN TV, Sawsan Safa Darwish, chuckled at the assassination of Walid Eido during live coverage of the blast that killed the anti-Syrian Lebanese official, his son, two star soccer players and 6 others in Beirut. NBN-TV is owned by Nabih Berri, the pro-Syrian speaker of the Lebanese parliament. Sawsan Safa Darwish laughs at the assassination of Walid Eido on the air in Lebanon. YouTube Video (CNN) on this disgusting human being- HERE. NBN-TV says it was an unintentional mistake! ** The video (not in English) was posted on YouTube HERE. A pro-Syrian NBN presenter Sawsan Safa Darwish was caught on tape unaware that her microphone was still on asking why it took so long to assassinate Lebanese MP Walid Ido. She also wondered who would be next and said she hoped that it would be anti-Syrian politician Ahmad Fatfat. And, she did this while the camera was showing scenes of the bomb blast that had just claimed 10 lives including anti-Syrian official Walid Eido and his son and two prominent soccer players! From Beirut to the Beltway reported on this despicable human being. Beirut – During the live coverage of Walid Eido’s assassination, Nabih Berri’s news channel anchors forgot to mute their microphones as they proceeded to laugh at the murder of Eido, and imply there was more coming. NBN’s technical director forgot to kill the anchorwoman’s microphone, allowing viewers to hear her say “it took them long enough”, in reference to Eido’s murder. In between rounds of laughing and gloating with her colleagues, they speculated that March 14 minister Ahmad Fatafat could be next, and tried to determine how many more March 14 members need to die to get rid of the parliament’s majority. Beyond the divisive and damaging insults being cast in the aftermath of one of the most violent and tragic political assassinations in Lebanon’s history which claimed the lives of 10 citizens, the sick comments open a can of worms for Lebanon’s delinquent speaker of the parliament, Nabih Berri and his closest ally, Hezbollah chief Hassan Nasrallah. The NBN employees imply that there is in fact a plan to eliminate the anti-Syrian majority by killing off their members of parliament. According to Al Arabiya TV, Ahmad Fatfat is already planning to sue NBN for implying that he is the next assassination target, and plans to ask U.N. Chief Investigator Serge Brammertz to raise the incriminating remarks with international courts. 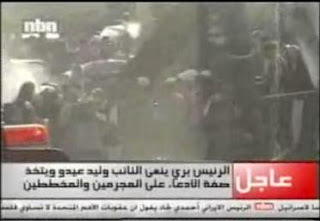 Angry Arab News says the clip was later played on Al Arabiya TV. The BBC reports she was sacked. BOOM! Another Anti-Syrian Politician Assassinated in Lebanon!